Maybe it was bad karma. Maybe it was just bad luck. Whatever the reason, fifteen-year-old David was born defective. His bug eyes, pinched face, and hearing aids are obvious, but there is a secret David keeps from everyone, even his foster parents. Because of a thin layer of skin hidden under each arm, David can fly–well, glide is more like it. Terrified of doctors, wary of letting down his guard, David is determined to hide his secret at any cost. But then David meets Cheetah, a girl whose own defect doesn’t diminish her spirit, and suddenly his life begins to take wing. In this arresting new novel, Weaver creates an unforgettable character on the path to discovering that some blessings can be a curse–and some curses a blessing. “[E]erie cover and enticing premise will draw readers in for a big payoff.”—Booklist. “[P]rovocative novel.”—VOYA(Voice of Youth Advocates). “This story is incredibly touching and powerful, and honest. . . .”—TeensReadtoo.com. “[A]touching story that has a lot to say about whether we wear our bodies or they wear us.”—The Bulletin of the Center for Children’s Books. This novel has much to do with some time I spent at the Mayo Clinic as a thirteen year old. I had a facial injury (my nose) which took some fixing, and that feeling of being disfigured (temporarily) stayed with me. 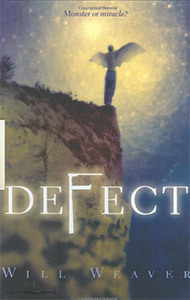 Defect also has to do with the literary issue of the young adult “problem novel.” Nowadays, fictional realism has hit a wall in terms of problems to explore; that is, the problem under investigation had better be really interesting!